« Sephardic Eggs: take two! So, my Windowfarm has been growing for 3 months, with middling success and it’s time to make some decisions. What to harvest? What to start for the next round? With such small amounts, harvesting the kale and arugula will decimate the farm and the yield is so miniscule, it would seem appropriate to cook it up on the toy kitchen in my daughters’ room. Lesson number one: start your next round of seeds earlier, so they are ready to transplant at the time of harvest. 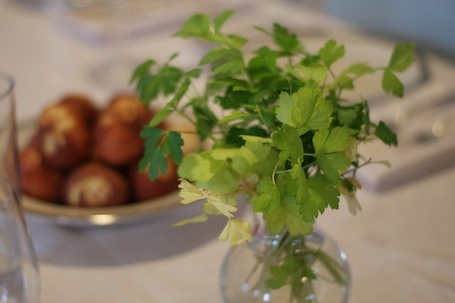 Having just figured that out, I couldn’t wait for my next round of seeds because I needed to harvest my parsley for our seder plate – you see, I like to source my bitter herbs locally. I chopped off the whole lot and we passed them around and ate them dipped in saltwater. Delicious! Parsley is definitely going into the second round of the Windowfarm. Lesson number two: unless you have a gigantic Windowfarm, you are better off growing herbs that you can clip a little at a time when needed. One thing I regret not growing the first time around is basil – who wouldn’t love some fresh basil in the wintertime? So, basil seeds are on the list. We only have six slots, so we have to choose carefully. My tomato plant grew wildly out of control trying desperately to get enough light. It made me feel bad: all that straining and no flowers. My plan with tomatoes is to transplant them into traditional window boxes in our sunny stairwell and see how they fare, leaving the more delicate herbs for the Windowfarm. 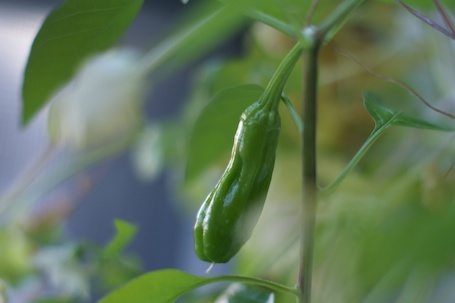 That is, except for our biggest success so far: Shishito Peppers! Shishito peppers seem to love the Windowfarm environment, and perhaps I should just make it all about them, but I am inclined to diversify. Last night, I started a new round of seeds: Basil, Parsely, Cilantro, and Shishitos. We’ll see what transpires. In window pots : tomatoes, mint, scallions and pea shoots. If I’m feeling particularly adventurous: ginger, quinoa and maybe I’ll throw in a rice paddy! It’s planting season! What are you growing this year? Indoors or out! This entry was posted on April 11, 2012, 11:42 am and is filed under Windowfarm. You can follow any responses to this entry through RSS 2.0. You can leave a response, or trackback from your own site. Hi, like you I enjoy the challenge of growing indoors, my space outdoors is limited! during the winter i grow the herbs indoors, parsley, chives, rosemary, mint, thyme, sage, basil, and oregano. These pots move outdoors in the summer, and have been around my kitchen (except the basil) for 3 or 4 years now. I have very little luck with basil – but continue to by it from the herb gardener at the famer’s market about every 3 or 4 months. Good luck with your harvest and next season. I admire your tenacity and enjoy your blog! I haven’t had much luck with basil, either, but am definitely going to focus on herbs this year. I’m reading An Everlasting Meal by Tamar Adler and her chapter on herbs is pure poetry! Only throw in the rice paddy if you’re feeling Pearl Buck-like and plan to give birth in the fields while harvesting. (I hope I’m remembering that illusion to The Good Earth correctly, otherwise, as Rosanadana, of blessed memory, used to say: “never mind”). As far as the basil is concerned, it is so temperamental and sometimes yields so little, but the aroma is the best. You cannot go wrong with chives. They simply grow and expand with no maintenance or pest problems. Pick leaves and use them on salads and jusy about everything you cook to enhance flavor. Garlic chives are also excellent. Their leaves can be picked like regulaer chives and they add a mild garlicy flavor to your food. Whan the chives and garlic chives start to ougrow their space, dig them up and divide them into halves. Plant one half back in the space. Plant the other half somewhere else, or put it in a small pot and give to someone as a Christmas or birthday present.